Conversion tracking, click fraud monitoring and A/B testing for online marketers and agencies. Everything you need to measure and improve marketing results in one place. Just sign up at this link to get 14 days free and your 10% discount for life! 1. Find out where your customers came from without having to ask them. Know which link they clicked on to get to you, the keywords they typed into google, or the ad they saw that lead them to your site. 2. 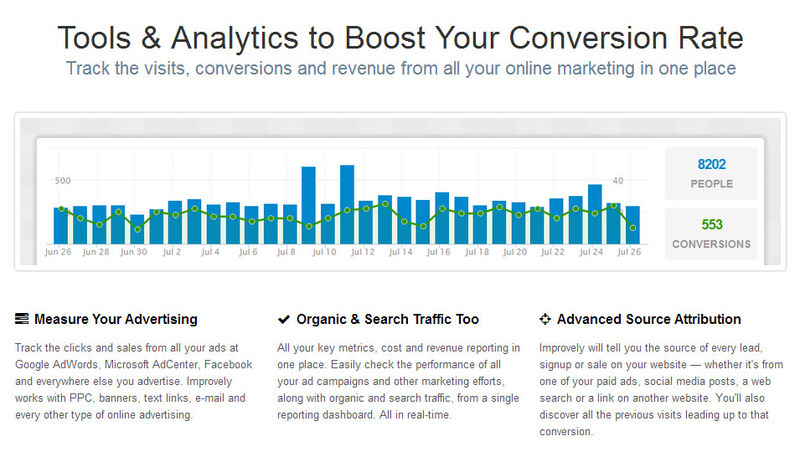 Keep track of your Google Adwords, Bing Ads, Facebook and other advertising costs. 3. Find out if there has been PPC click fraud, so you can stop paying for clicks that shouldn't count! Follow the link after you click on Redeem, and you will get a 14-day free trial and also a 10% discount for life. Their plans start at $29 per month (but $26.10 with the 10% discount). Other advanced plans are available if you are serving a lot of users/vistiors (which we hope you are). If you have any questions regarding the deal, please shoot an email over to hello@improvely.com.